The following is a list of our panels that deal specifically with varying aspects of cosplay. 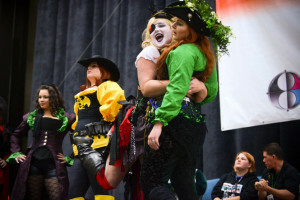 Each one is taught by either one of our cosplay guests of honor or an expert in the field well known for an exceptional skill in that specific aspect of cosplay. Make sure to take some time out of your busy schedule at the Grand Rapids Comic-Con to attend a panel or two about the art of cosplay and polish your skills in the craft! There will also be a group of panels by the local costume charity clubs in West Michigan. If you are looking to join a costumed club to use your skills for charitable causes then make sure to check out the group that interests you the most. The schedule of their panels is here. A participant in the SyFy show ‘Face Off” as well as giant prop builder, Rob discusses the art of making armor and larger fabrication items with limited funds and resources. Foam is a cosplay builder’s best friend and if you’re ready to get started with it, this is the panel for you! Come and learn the basics of working with foam for building props, armor and all sorts of crazy cosplay contraptions. Envy the Green Fairy Cosplay, Knightmage, House of a Thousand Glue Sticks and Friends! Our #over30cosplay panel is exciting and focuses on a target audience of older cosplayers and how our topic categories affects over 30 cosplayers, and how we can help them with any questions they may have. We’re not just a regular cosplay 101 panel, but rather an informative and helpful discussion about how to deal with all of these cosplay topics and issues when you are over 30, especially with all the unique things that older cosplayers deal with and how to make cosplay a meaningful family event. Have you ever struggled with feeling positive about your cosplay or how you look in it?? So have we!! The truth is, Cosplay is for everyone one and we’d like to share some of our experiences and encourage you to love what you cosplay! Ready to learn about the basics of thermo plastics, where and when to use them? Got some questions you want answered before you’re ready to start plastic smithing? Need some cheaper alternatives to the name brand plastics? Come and join us and we’ll talk about how not to burn yourself with a heat gun! Knightmage, the reigning king of cosplay, and Danielle Colby, the queen of rust, will combine forces to discuss the cosplay phenomenon and how to incorporate vintage clothing into costuming. Danielle will answer questions afterwards on “American Pickers”. Watch numerous fans strut their stuff in their best cosplay to win cash and prizes. Cosplaying for a Cause can be the best thing about dressing up. If you’re curious about taking that step, come join us as we discuss our experiences and how you can get started! Ready to get started in the basics of making yourself look like someone else? Join us as we discuss and answer the basics of both practical and SFX Cosplay makeup and everyone’s favorite subject, wigs! Prepare for “awws” as we watch the little ones parade across the main stage. Also the costume contest around the anime sensation “RWBY” will shortly follow.